The Blizzard of 1888 in New York City, via Wikimedia Commons. During New England‘s Blizzard of 1888, also known as the Great White Hurricane, over four feet of snow fell in Connecticut and Massachusetts. The storm dumped as much as 40 inches of snow in New York and New Jersey. In a world before road salt and snowblowers, the Great White Hurricane suspended communication and travel in the U.S. Northeast for nearly a week in March 1888. History most remembers the particularly horrific conditions in New York City. There, the New York World reported that almost two feet of snow had fallen amidst biting 50 mph winds and sub-zero temperatures. However, the storm also wrought havoc in smaller northern cities along the US East Coast. A wet, swirling snow began to fall around dawn on Monday, March 12, 1888, in Lowell, Massachusetts, then a city of about 65,000 residents. Many of Lowell’s residents, workers in the textile mills, gingerly picked their way along slick sidewalks as they began their workweek. Most did not know that a blizzard was approaching and that it would drop increasing amounts of snow in Lowell on that day and the next. As they took their places behind their spinning machines and warpers, the morning’s light breezes intensified into winds and then gales. Temperatures, near freezing in the morning, never warmed. Outside the mills, milkmen shoveled passages through drifts that had grown several feet high. Patrolmen struggled through blinding snows before being forced to suspend their rounds later that afternoon. Most agreed that they had never before seen such a storm. Almost all had thought these kind of storms only happened in the “west”, which had suffered through the Schoolhouse Blizzard just two months before. Windows, and even their buildings, rattled in the howling winds as heavy, wet snow began to blanket Lowell, Massachusetts. Communication with other cities was soon lost as strong gusts brought down telephone wires and telegraph poles, already heavy with snow and ice. Travel to, from, and around Lowell soon devolved into chaos. Snow drifts grew to ten, or twenty feet high on some train tracks. Those lucky enough to arrive from surrounding towns and cities came late. Some unfortunate souls ended up stranded with their disabled trains in a dark, white wilderness. The heavy, wet snow just proved too much for the steam engines. To make matters even worse, downed telegraph wires meant that the stalled trains had lost all means of communication, leaving the stranded passengers and crew completely cut off. For those relying on horse-cars to travel within Lowell, the situation was hardly any better. Snow had settled into the horse-car tracks far more quickly than the plows had been able to remove it. This, and the increasing number or passengers seeking refuge on the city’s horse-cars, began to overtax the city’s work horses. Newspaper accounts recorded the concern expressed over the horses’ welfare. When one of the horses dropped dead from overexertion early in the evening, the horse-cars were called back into the stables for the night and any attempts to keep the tracks clear of snow was given up. Those stranded in Lowell remarked at the city’s oddly quiet streets, deserted without a single horse-car, or even any visible horse-car tracks for that matter. Sleighs gradually claimed the streets, no longer needing to be mindful of the usual risk of overturning in the horse-car tracks. City officials fretted that an electrical surge would take out the city’s fire alarm system. At 5:30 that afternoon, officials shut down the city’s electric light system, after sending a notice to shopkeepers advising them to convert to their gas lights. Most closed at dusk instead, sending their employees out into the evolving chaos that had been the city’s transportation system. City officials tried to light their way using the old gas light lanterns that still hung along most streets. They soon abandoned the effort, however, when they learned that the glass was missing from most of the lantern panes. The increasing weight of the wet snow proved too much for telegraph wires too. Communication with Boston was lost by 3 PM on March 12; New York fell silent several hours earlier. 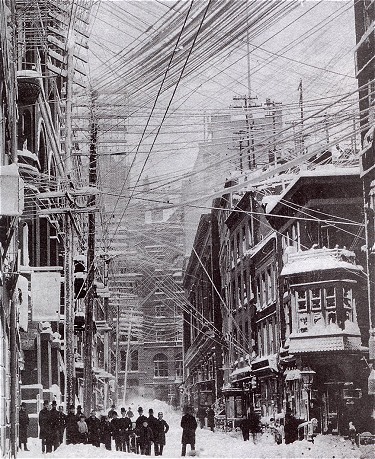 New England Telephone Company suffered extensive damage to its telephone lines as well. The sun finally reappeared by the afternoon of Tuesday, March 13, but failed to melt much as temperatures failed to hit even 30ºF. Throughout the day and evening, teams of men picked away at the deep drifts covering the horse-car tracks with their picks and shovels. Horse car service began to be reinstated on the following morning. By dusk on March 14, nearly all horse-car service was available. Train service, too, began to return to a state of normalcy. Trains that had spent the storm trapped within deep drifts began arriving during Tuesday, March 13. A train that had left Fall River, Massachusetts at 5:45 AM on that day arrived in Lowell almost 12 hours later, at 5 o’clock in the afternoon. By Wednesday, March 14, train service too had returned to normal schedules, even though even a passing snow squall had dropped even more snow on the area. Western Union and New England Telephone remained hard at work in the days following the storm. Although Western Union began work on felled telegraph poles after the storm ended on March 13, it was several days before service was restored. New England Telephone had restored most of its service by Thursday, March 15. Electric light service was restored to Lowell by dusk the night before. As repairs were completed in the days following the storm, the Blizzard of 1888 faded from local newspaper headlines. And as communication was restored with Boston, New York and beyond, news of the extent of the damage in New York City became known, where deaths and much more serious damage had been recorded. Lowell, Massachusetts, recorded several injuries related to the Great White Hurricane of 1888, but escaped the greatest brunt of the storm. 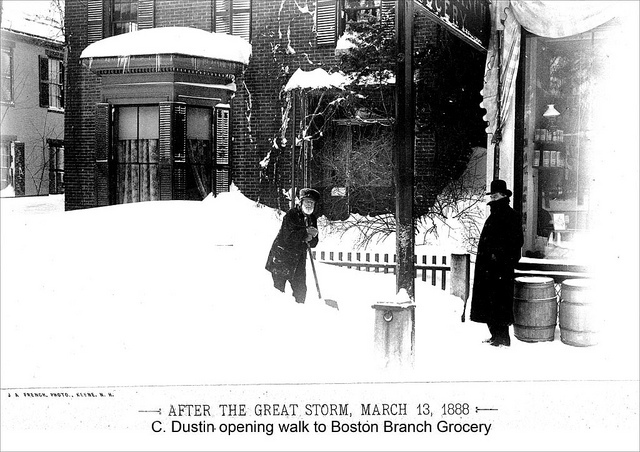 The Blizzard of 1888 remained the benchmark for all other snowstorms, however, for nearly a century until the Blizzard of 1978 swept across New England and became the storm of record. A great narrative, really enjoyed this. Thanks for stopping by and for the comment, David. I love these stories you tell on your blog– they really make history and our ancestors REAL. My parents till talk about the blizzard of ’78. Thanks Karen – I have pictures of myself lost among the snowdrifts of the Blizzard of ’78. We just don’t seem to get storms like that any more. I’m glad you like the re-design. I thought I’d try something a little different for a bit.